The past few weeks have been filled with generosity and gratitude. 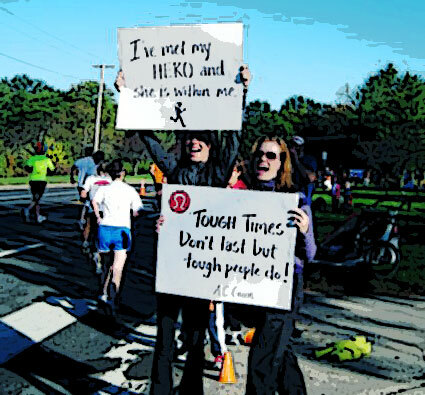 When I volunteered to cheer on the ING Marathon runners on Saturday, October 9th with my lululemon colleague, Jeanne, I had no idea how powerful the message of our cheer signs would be. The sign that Jeanne held read: “I have met my hero and she is within me.” We were thrilled to discover that this sign would have a huge effect on the female runners including Christine Lee, the morning DJ at 96.5TIC FM, who was so inspired by the sign that she ran 12 minutes faster in the last six miles of the half-marathon than she did in the first half! Cheering on others got me thinking. As Aristotle said, “Happiness is an expression of the soul in considered actions.” Our “considered action” that day wasn’t necessarily to improve people’s run time, but rather to give them a little distraction at the six-mile mark of the half-marathon. But as it turned out, what we gave to the runners came back to us ten-fold. (When we visited Christine Lee at the 96.5TIC FM station last Monday to present her with the sign, she thanked us personally on the air!) Stephanie Blozy, the owner of Fleet Feet and a fellow cheerer, also mentioned our signs and the effect of She-ro’s in her most recent newsletter. There is a phrase in the Bible that reads: “Daughter, be of good cheer; thy faith hath made thee whole.” Whether or not we are religious people, most of us can acknowledge the correlation between faith (in another… or in ourselves!) and our ability to be cheerful. We cannot cheer on others unless we have faith in ourselves. We cannot cheer unless we project happiness and generosity as wholehearted expressions of the soul. Think about all the times you’ve cheered on others (e.g., children, spouses, or complete strangers running a half-marathon). Now think about the last time you cheered yourself for something you did. On Sunday night, the last day of my 3-week detox, I cheered myself for having completed it to the best of my ability. Last night, I cheered myself for trying CrossFit for the very first time. Cheering oneself doesn’t necessarily mean standing in front of a crowd and shouting: “I’m awesome!” It can simply be a moment of reflection or a feeling of gratitude. A general nod to the universe for feeling good…or for scoring that last parking space in a crowded lot. Love the picture! Having been a cheerleader in high school, the thing that always amazed me was how it motivates and unites people, who otherwise would be alone in their experience. Your post came at a time when I was trying to no avail to figure out how to access a report. I got so frustrated that I called the company for assistance, but got voice mail instead. So I plodded on by myself and finally got it right. I immediately cheered myself for not giving up and persevering. Yay Me! !